Race Prep Honda B16 cylinder head. As with most things in life, it’s the details that make the difference. You might not think that a measly degree here or there could make more horsepower when it comes to a valve job, but there’s power in those angles. Engines use valves to control airflow for both the intake and exhaust systems. While sealing cylinder pressure is also important, performance-engine builders know that proper angles employed on a valve job can have a tremendous effect on airflow. And we all know that airflow is the key to making power. Increase airflow past those seemingly insignificant valves and you’ll make more power. It’s that simple. Since flow decreases anytime air is required to change direction, it makes sense to create the transition past the valves as seamless as possible. With that in mind, decades of race-engine builders have discovered that multi-angle valve jobs do the trick. The actual valve-seat angle is generally 45 degrees. On the combustion-chamber side of the 45-degree seat is a top angle that is usually around 30 degrees. This top angle serves two purposes. First, it acts as a radius to transition air between the 45-degree seat and the combustion chamber. Second, the top cut is used to reduce the width of the 45-degree seat from the top. The bottom angle, usually around 60 degrees, is often called the throat angle, and it also has two functions. Its primary task is to transition air between the 45-degree seat angle and the port. The throat angle also reduces the width of the 45-degree seat angle from the bottom. But there’s much more to this than just angles. The position and width of the 45-degree seat on the valve is also crucial. For the intake valve, most head specialists like to position the seat as high (toward the chamber) on the valve as possible. One way to check this is to use valve-lapping compound that etches a light gray mark on the valve to reveal where the 45-degree seat contacts it. Some engine builders prefer to use red machinists’ dye instead so the compound does not cut into the carefully placed angles. Most machine shops prefer to place the valve seat in the middle of the exhaust valve for durability reasons. A seat too close to the edge may cause a burned valve. The seat width is also very important to flow. There are almost as many theories on seat width as there are head masters. Most of the machinists we spoke with prefer an intake-seat width of 0.040-0.060 inch. Narrower seats generally improve flow but are also less durable. Narrow seats work best on drag-race applications where the engine is freshened often. Harder seat materials (e.g., induction-hardened seats) allow you to run slightly narrower seat widths than in the past while retaining excellent durability. Since exhaust valves operate at extreme temperatures, they require a wider seat to conduct heat away from the valve through the seat. Most shops specify 0.060- to 0.080-inch seat width for the exhaust side. The position of the valve seat in the head is also important. Each time the valve seat is machined, material is removed and the seat “sinks” into the head, moving deeper into the port. This tends to sharpen the short-side radius of the port, which reduces flow. Larger valves (or fresh seats) often improve flow because the larger diameter repositions the seat back toward the combustion-chamber side where a fresh valve job can take advantage of the gentler radius. Valve seats constitute only half of the flow picture; the other half concerns valves. They all might look the same, but the many high-perf valves on the market are a testament to how much attention should be paid to improved flow and durability. Companies such as Ferrea, Federal-Mogul, Manley, Milodon, Rev, SI, and many others offer performance valves in several configurations. You can spend big bucks for upscale valves, but the market is full of excellent valves for the street that offer excellent flow and durability at a reasonable price. The first thing the valve needs to be is straight, which includes the tip. Most shops won’t assume a new valve is straight and will touch up the valve face to ensure concentricity with the stem and machine the tip to ensure it is perpendicular. Besides the 45-degree face, a valve must also have a margin as shown in the Intake sidebar. Intake valves should have a margin of about 0.050 inch, and the edge should be sharp where it transitions to the face of the valve. Exhaust valves are a different story. The margin for an exhaust valve should be larger to improve heat dissipation—generally around 0.080-0.100 inch. Because the flow path for an exhaust valve is the opposite of an intake valve’s, you will sometimes see a smooth radius on the chamber side to improve airflow into the port. There’s plenty happening on the back side of the valve as well. One of the best and least expensive tricks you can apply to any valve is a 30-degree back cut on the inside of the 45-degree valve seat. This creates a smoother transition between the backside of the valve and the 45-degree face, and it usually results in measurable gains in low-lift flow. This can be applied to both intake and exhaust valves. Reduced-diameter valve stems such as Manley’s Street Flo or Race Flo valves often exhibit a slight flow increase depending upon the application. Several other companies including Milodon and SI also offer this style of valve. Few backyard hot rodders own their own valve-grinding equipment, so most of this information is geared toward knowing the right questions to ask your machine shop and investigating the kind of work they perform. Perhaps the most significant leap in valve-seat preparation has been the use of a dedicated cutter rather than stones. The Serdi was the first machine of this kind. It uses a hardened-steel cutter that machines all three angles in the seat simultaneously. Previously, a valve job was a time-consuming task that used stones to individually grind each valve angle. Most engine builders now consider cutters superior to grinding, but there’s still plenty of debate on that subject. Regardless of the machine, the key to any good valve job is having a high-quality valve guide that accurately locates the valve. This means new guides and minimal clearances to ensure that the valve does not move around relative to the seat. This has been our entry-level overview of what goes into a high-performance valve job. There’s much more to this subject, but this should give you a solid grasp on the importance of a professional valve job. It’s attention to those little angles and details that make the difference between a lackluster engine and a real street stormer. 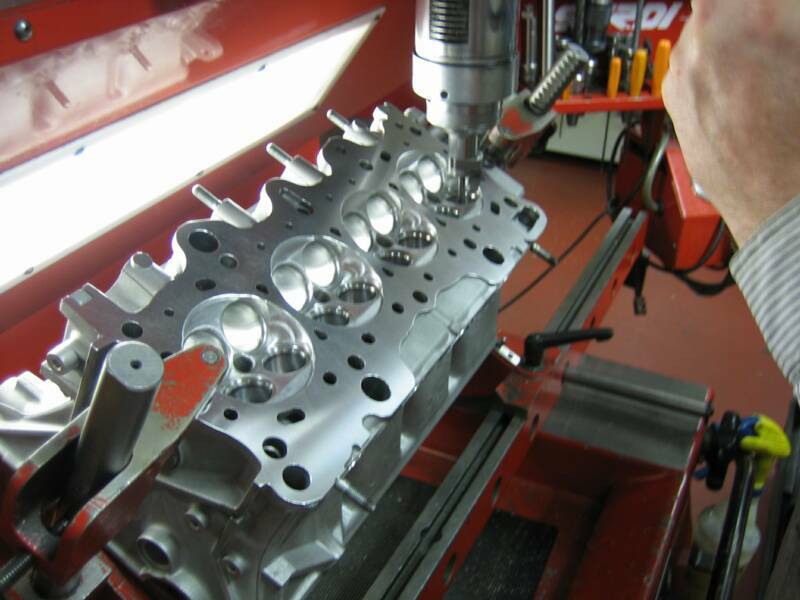 Cylinder Head Machining & Experts In Cylinder Head Rebuilding and application. 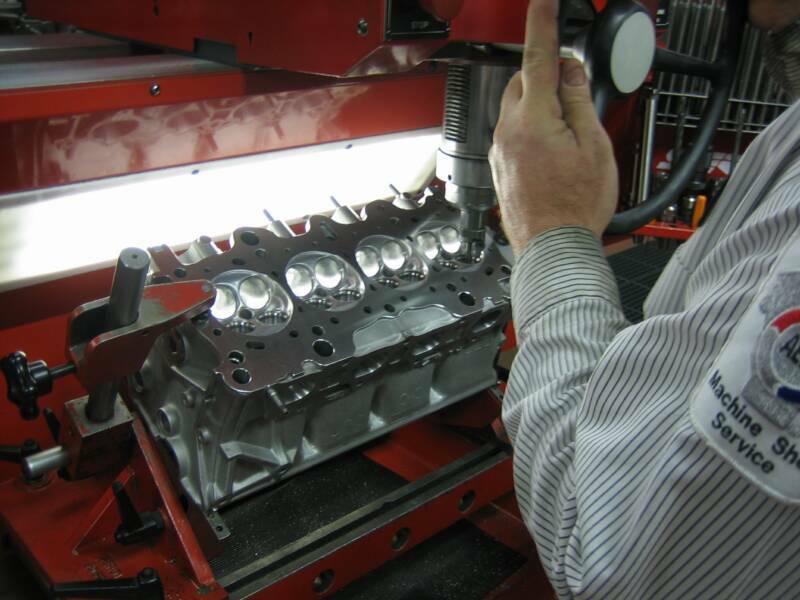 R & L Engines utilizes the latest tooling that enables precise surface finishes and sizing. Our head department is equipped to perform the highest quality performance valve job any where. Our services include valve jobs, seat installation,guide installation, crack repair, pressure testing, porting , surfacing , angle milling and cylinder head ringing.